Joining RENEW in October 2004, Dang Quang Toan is Manager of RENEW’s victim assistance program, working osely and keeps regular contact with local partners of the project to carry out victims assistance activities within the project areas. Toan is also responsible for setting up plans and formulate proposals to call for funding from donors. He is also responsible for liaising and organizing cultural and sport exchange events between international friends and local youth. 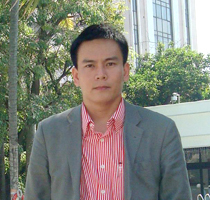 Toan earned a B.A degree in English from Quy Nhon University and had attended a number of training courses and workshops in country and abroad.